Our most recent project, a series of medical illustrations, depict the da Vinci robotic arms as they operate inside the female human body to surgically dissect the inter-vesicovaginal space without opening the bladder dome. 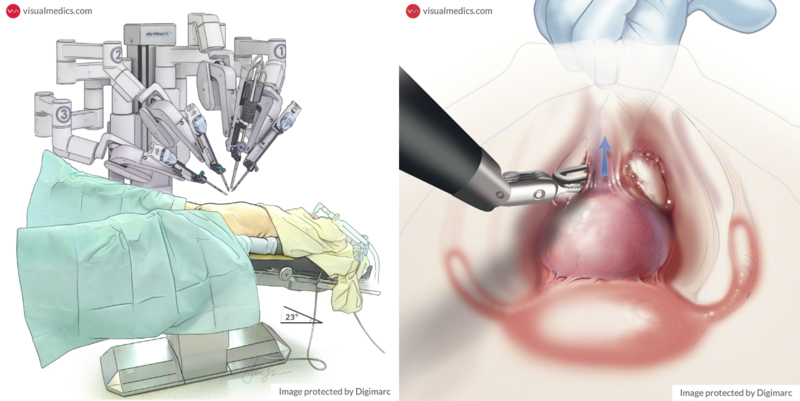 This preparation is necessary for the insertion of a female Artificial Urinary Sphincter – a procedure that is now entirely possible with the da Vinci robot, minimizing post-operative recovery. When we first started this surgical illustration project with a medical device company, we took the opportunity to get to know more about this fantastic robot device and the people behind it. We discovered that behind the robotic surgery technology is a woman who has played a significant role in the development of the da Vinci robot as we know it today: New Zealand-born Catherine Mohr. It’s worth sharing her background; we always like to see women in tech at this level.